IN THE YEAR 1850 my grandparents with my mother and her two brothers crossed the plains from Missouri to California in six ox wagons. There were 175 wagons in the entire train, for many other families went along at the same time. They had been on the road six days, when by accident my mother, then just a child 12 years of age, fell out of the wagon. The wheels ran angling across her body. My grandmother had some homespun sheets; so she tied the four corners of one to the wagon bows and put a feather bed in it. In this hammock-like arrangement, my mother rode all the rest of the slow and painful journey to California. It was six weeks afterwards before she could sit up, and for quite a while of this time they did not think she would ever be able to sit up again. They were three months on the way over. "Indians Coming! Corral the Wagons!" "Indians Coming! Corral the Wagons! " Early one morning, Father and Dave Doudle, the interpreter, spied a lone horseman ahead of them. Father says, "Dave, looks like Indians." Dave says, "No "
But about 11 o'clock, Dave came to father and exclaimed, "Sure they are Indians, Corral the wagons! Put the women and children in as few wagons as possible and put those wagons inside the circle!" And just as soon as the wagons began to circle, everybody knew what was conning. My father raised his white flag; the Indians raised their red. On came the savages with their war yell. About a hundred of them had circled around, when all at once their leader gave a peculiar yell and every one of them halted. Twelve of them held a council. Then they came to my father's wagon and gestured. Dave Doudle did not wish them to know he could interpret, for he knew what it would cost the train. But after a while Father found out the Indians wanted 30 fat beeves, so they gave them freely. At once they all became peaceable and quiet. Father had the compass and square and the letter G painted on his wagon, sheet before he started. When the Indians learned whose wagon it was, they called for Father's family. So father took the chief by the hand and led him to the wagon inside the circle. Seeing me in my hammock, he bemoaned my pitiful condition. Taking hold of my hand, he patted and rubbed my head, with me scared nearly to death. Our train had to strike camp that night and 50 of the warriors galloped off over the hill. In the meantime, Dave had let himself be known in their native tongue, and then such shouting and hollering as they did, I never heard before. The next day, Dave and the chief showed Father 500 men, women and children coming over the hill. They put Father up on a chair and he then shook hands with every one of them. For three days afterwards he carried his arm in a sling. We camped right there five days. When we left, the chief had my father go in peace, telling him he would not he molested on the rest of the journey. Then occurred a most dreadful thing. In our train there was a young boy newly married, a know-it-all. No one could tell him anything. He swore he would kill the first Indian he saw. We came upon an old Indian squaw, white headed. Sure enough, this boy drew his pistol and shot her dead, everyone begging him not to. My father was 50 wagons ahead and did not even hear the report of the pistol. Father said he did not know the boy had such a weapon, or he would have taken it away from him. Three days afterwards they looked back and saw 150 warriors coming at break-neck speed. They never stopped until they came to the three horsemen, my father, Dave and another man who was a preacher. They asked who killed the squaw. Neither of the three men knew. "If you do not tell us," they said, "we'll massacre the whole train." Father halted the wagons, took the Indians back with him and the other two men. When they came to the fiftieth wagon, a little boy 10 years old spoke up and said the fellow who killed the squaw was in that wagon covered up with a feather bed. "Come out," demanded my father, "and tell why you did this thing; if you do not, every one of us will be killed." The boy carne out and told them. His parents and his wife's parents tried to buy the Indians off, but no. They took him a short way from the wagon, hung him up feet foremost, and flayed (skinned) him alive. They then told my father they could go, but not to touch that man. The whites had to do as the Indians said. It almost killed the young wife and the boy's mother and father. They lay for three days in such a condition that the others did not think they would or could live. After several days travel we came to the Pecos River in Western Texas. It was running bank full. Our cattle were so thirsty they simply fell in on their heads. Some were drowned and some swam out. The wheels were taken off and the wagons placed three together lengthways. This made a raft. So they ferried everything across in this way. And that is how we got over Pecos River at Horsehead Crossing in far Western Texas long, long ago, and then went on our way, again to California. The foregoing concludes my mother's part of my story. The rest, which we heard her rehearse many times, I shall now tell myself. She raised her own corn, kept the wolf from the door, raised most of her cotton, pulled the lint from the seed with her fingers, spun the thread, wove the cloth, and made clothes for the family. She did the same with the wool, which she sheared from her own goats. She had to go three miles to water to do the family washing. This she did with her own hands. The clothes were boiled in a small oven or spider —so small that the larger pieces had to be boiled one at the time. At length there came a day when the community in which my mother lived got entirely out of breadstuff. They had meat in abundance but no bread and no salt. They killed and dressed their own beef and pork. One day when she and a neighbor had dressed a hog, the question came up of what they were going to do for bread, for they had not had any for three or four days. There had been some talk of plenty of wheat being owned and held by some planter over on or near the Louisiana line. Mother said to the neighbor woman, "If you will go with me, we'll go and get us a load of wheat." My mother owned a fine span of large black mares. 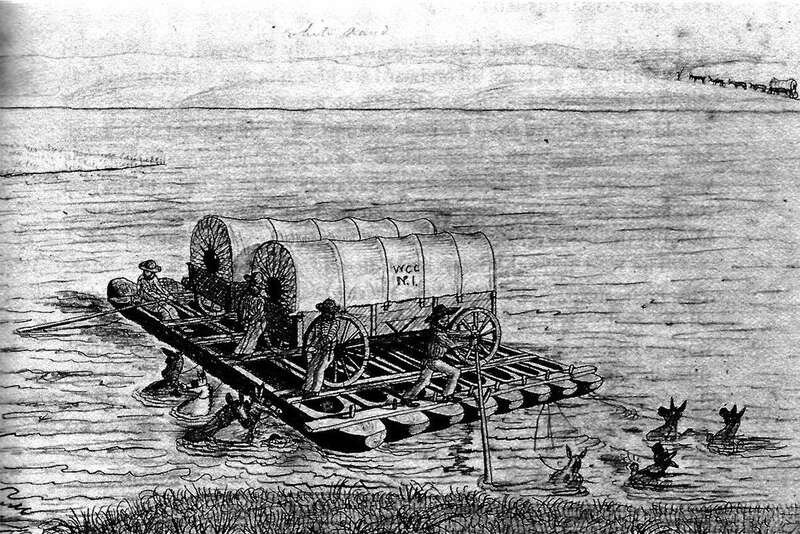 These were put to the wagon and off went the two women for a 10 to 15 day's journey and made it in just 8 days. They offered him $25 for just five bushels. "Sir, I am neither beggar nor thief: but I have come after wheat and in search of bread. When they found their wheat man sure enough they expect to get it." By this time the old man had become very angry. "You need not get so full of wrath, " Mother told him, "God will certainly reward you for your wrath." For a second time the man got worse. My mother picked up her Winchester and turned toward two of the slaves that were in the yard. "Show me the wheat granary," Mother commanded. "I mean just what I say," were the words of Mother that broke the great stillness. So the old man turned to the slaves and told them to go on. One of them got a cedar tub to measure the wheat in. Mother drove up to the granary, filled her wagon bed, with the double side-boards, full to the brim. As she drove back past the house, Mother was hailed by the planter's wife. Mother again offered pay, but the man refused it. "Where do you live and what is your name?" the planter inquired. The man then motioned to his wife, who went back into the house. Presently here came two slaves with a sack of coffee. Then they brought a barrel of sugar, a 100-pound barrel of salt, a 50-pound of honey, and of syrup. "If you honest women are also brave enough to risk your lives for five other families, surely I can afford to give something." They went away and arrived safely at home. Not a soul did they encounter, although the Indians were raiding just five miles west of their route. In a short while the Indians were out raiding again. A messenger came telling about it. The nearest neighbor was five miles away. Mother left her baby with her two younger sisters, saddled her horse, buckled her pistol around her waist, took her Winchester on her saddle (side-saddle), and off she rode up into Wise County, after her horses and cattle. She was gone eight days—did not see a house, or a soul, or a fire. Had no one to face the danger with her. The night of the eighth day, she came upon a fine thicket to bed her cattle in just a mile from home. She bedded them down and struck out. Half a mile from home, she saw on a high hill, lighted by the sky, the figure of a single horseman. Mother gave him time to come pretty close, then put spurs to her horse so as to go by him out in the bushes. As Mother dashed past, she heard a familiar voice call out, “Miss Sidney! Oh, Miss Sidney! Is dat you?" Mother got her cattle and horses safely corralled before the Indians came on. Those two mares she put in the smokehouse. The Indians tried every way to get her to open the door, but she refused. They shot the mares full of arrows; my mother cut out 50 the next morning. Mother and those little girls sat up all night. Just before day, everything became quiet. The Indians had gone. They carried off five head of cattle, but not a horse. My mother happened to have one of the oxen her father had driven across the plains. Strange to say, he was left in the lot. He was the only ox that had survived the last trip and was given to my mother. Ten miles further westward the Indians killed a family of seven and burnt the house down. And there were many other terrible Indian depredations in those pioneer days.